michele made me: It's Been My Pleather. I've had this same black pleather purse for gotta be 15 years now if not longer. Probably longer but basically forever. In fact, I have no recollection of choosing it, nor the vaguest memory of buying it... Nothing. Like, nothing. The thing refuses to die, okay? I'm fast becoming convinced that whoever made my purse soaked the finished bag in liquid titanium-kryptonite alloy before sticking a 4-sale sign on it. It's still in pristine condition. Like, it is absolutely PERFECT. It's like I bought it yesterday and yesterday was 1992. It's a little disturbing now that I think about it... Hmph. I simply cannot explain its utterly unaltered state because I lugged that thing everywhere and I abused the pea soup out of it. 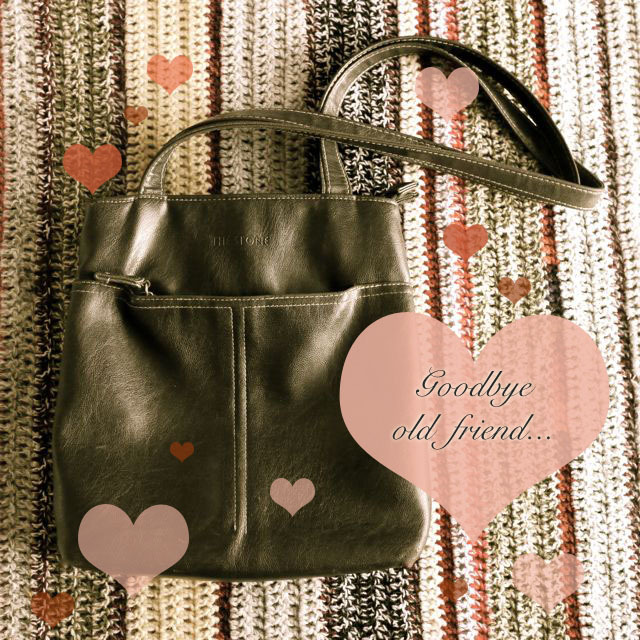 And I feel really bad saying this because that purse is great and has served me so well - like a dependable old friend actually... But I think... sigh... I think it's time for an upgrade. Does this make me a bad person?... I wonder. So I've been skulking behind shrubbery, spying on people and their bags, cruising the ether in hopes of catching sight of something very like my next purse. It's gotta be good. It's gotta be fan-freakin-tastic. It's got a lot to live up to. And I'm making it see? With my own two hands. Jah. But just so you know, I'm not getting rid of my old purse. Don't even suggest it. I COULDN'T! It is just too dependable, and I do love it still... I've decided to put it in storage. I'll keep it for when the end of world comes and we have to escape to higher ground. That old purse will be right at home under those brutal, post-apocalyptic, nuclear winter-like conditions. She won't even bat an eyelet. If you have any suggestions for my next purse, for the love of Pete, please share your link in the comments. Oh. my. God. You sound like me, only slightly more creative in your lavish description of this beauty. It's okay to move on and forgive yourself...really it's time. Oh btw, Bag #6 is gorgeous! Hello. I am thinking that what you call a purse is what I call a handbag but I'm not entirely certain. Anyway, if it is, I love the messenger bag over at mmmcrafts under her free tutorials. If I've got it wrong just ignore me! Good luck in your search. I will warn you that the blossom bag is a bear of a bag and may have caused me to say a few naughty words, sweat more than is becoming a woman and actually bleed a little. It is a lovely bag, but the directions are poorly written and it is not for the faint of heart. Whatever you make, make sure to soak it in titanium-kryptonite- or at least spray with scotch guard or other fabric protector to preserve it's life. Cotton is not nearly as forgiving as pleather. I am coming close to the ultimate bag for me. It's tricky business, though. I tend to carry around a ton of stuff, so my bag is large. That old indestructible purse of yours will be hard to beat. I have been wearing the same purse for the last 4 or so years. It's a cross-body satchel from Roots that I spent my birthday money on. I still love it, but I think it's time to change it up. 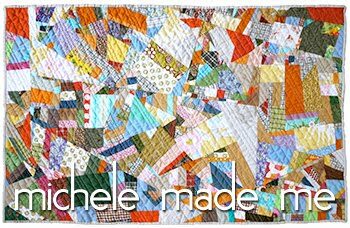 I bought Noodlehead's 241 pattern (not in your mosaic) and I'm thinking about using some of the canvas drop cloth I got on clearance at Home Depot to make it. I've heard the Blossom bag is a killer. But enjoy! I love your old purse! 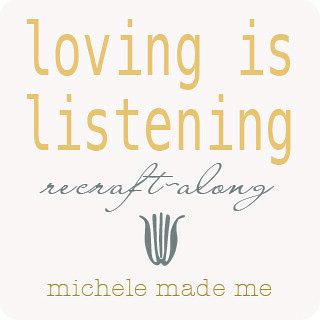 Dear Michelle - I hear your pain. I have been searching for the PERFECT handbag (Australian for purse) FOREVER. I keep buying handbags that seem to be just right, but fail everytime. I have found this wonderful website: http://www.studiokatdesigns.com/ and I am convinced that I could make the best handbag in the world from one of her many designs. Just haven't quite got around to it yet. 'Handbag Patterns designed for the way women REALLY live!' is her motto - gotta be worth a try I say! Anyway, good luck with your quest - I'm sure your old bag will still love you. So sad! Your purse is going to wonder what it did wrong! :) You've got some great ideas here for a new one. 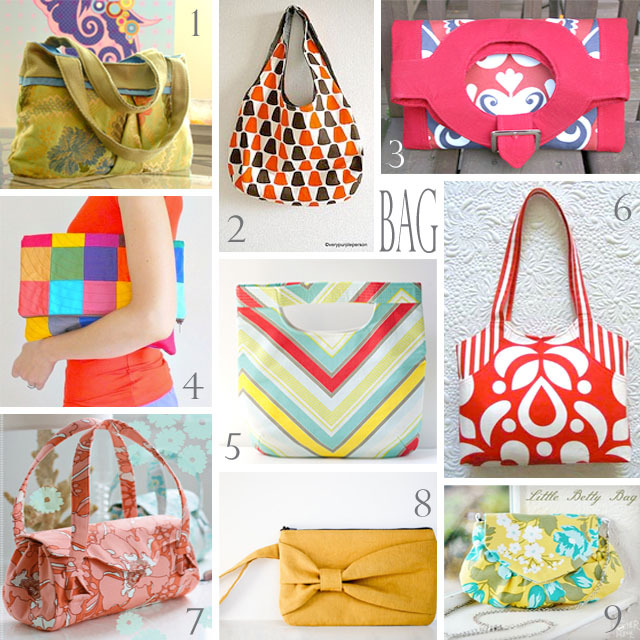 i really want one of the fold over purses, but with a 4 year old, it's hard to have one without straps! I’m with Felicity! The 241 pattern by Noodlehead is great, easy to make (that’s what I heard, because I still need to make one) but each and every bag I’ve seen on flickr looks great!! # 8 jumped out at me. I think it looks like you, I also like # 1; it will hold a lot. Maybe you could make them both. The clutch could be more girlie, dressy or when you just feel like carrying the basics, And the bigger bag can be your more everyday carryall. I am a bag person! I have them in almost all colors (to match my shoes, and sometimes not)but just like you I have a couple of oldies I just cannot get rid off! What I want to know is how it lasted so long. I go through shoulder bags every other year! I think change is good once in a while! I love my Vera Bradley Hipster bag. It looks small, but it fits so much. Pockets and zippers all over, with adjustable strap to wear over one shoulder or sling across your chest. I'm not sure if there is a pattern that mimics it, but maybe you can find someone who has one and ask to borrow and study it! Just hang it in the closet for a while... use other purses. One day this will be the perfect bag to go with your outfit du Jour. 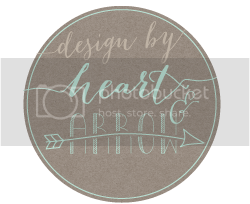 I recently made a bow clutch for myself using canvas. I did box the ends and make it a little longer to hold a few of my new extras I have to carry around. Love it! i have been loving clutches lately. and when i need something bigger, i just put my clutch inside. so i'm recommending that you make a bag system: clutch + shoulder bag. my favorite combo is #2 & #4.
but maybe #5 is a happy compromise. I loved reading this post! You are such a brilliant writer! Best of luck making your new purse- I have no doubt you will make something wonderful!